well ain't that just the truth Crazydave. Yep it sure is. So here we are in the week that sees Mr. Michael Martin released from his responsibilities, if it were you or I that had attempted to hide information that might lead to criminal convictions, as Mr. Martin did using tax payers monies with which to do so, we would no doubt be facing Trial by jury, with the CPS having a hard on for our conviction. As it is 'Sorry' is all these politicians have to say and its wayhay to the £70,000 a year pension and a Lordship in the offing. That is the sad fact about the priveledged elite in the UK. 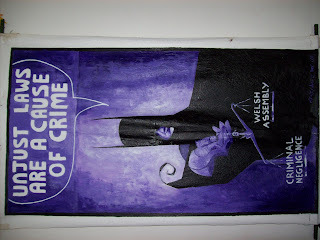 Have South Wales Police ever investigated any complaint made via your paintings Crazydave, no not even when the complaints are made under caution, and the Solicitor fails to ask the Judge when he mentioned that you make alot of accusations about a number of organisations, why it is that South Wales Police or the CPS aren't looking into those, but perseveer with their malicious proisecution of my client your honour??? init Law Society Dudes!! So today is to update the latest with the Ombudsman, my latest email it asks some questions that some committee of the houses of parliament really ought to be asking on my behalf at some public inquiry. That ought to have been held a few years ago, but hey its Crazydave Screw him. It was sent to the following and this blog will go to the Usual Suspects via a ficticious email address so that it bypasses their junk email filters, although we know that Julie Morgan does get them just doesn't respond. 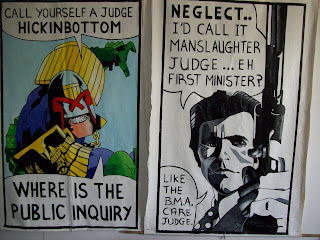 Systemic neglect Equality Human Rights Commission not unlike your organisation eh Crazydave. It appear that your online form isn't being sent at least there is no confirmation when I've hit send. I have copy pasted the form several times to email but the email will not send either. So I am going to reproduce what I filled in the form as myself here and send that. What amazes me is that the questions asked on it are those which I have already given in my previous emails, and that from an investigative journalist point of view is a deliberate attempt to delay the dealing with a complaint? So do I expect the Omudsmans office to make an unbiased decision knowing that they have deliberatley delayed in acting on a complaint of criminal negligence or supplied them with evidence of threats of violence against me by Mr. Watkins Lodger, since sending that information over a week and a half ago there has only been three hits on that video, so all the usual suspects couldn't be bothered reading the email or looking at the evidence. name of the public body you are complaining about: Cardiff County Council the Welsh Assembly Government and South Wales Police. What do you think they did wrong or failed to do: I believe all three bodies have been criminally negligent towards my health and welfare. How have you suffered personally from this: Immeasureable to the detriment of my physical emotional mental health, and financially. When did you first become aware of this problem: In 1999 and more urgently in Feb 2002. Have you already complained to the body concerned? if so, please could you give brief details of how and when you did so: yes I have on numerous occassions via letter phone and email and by demostrating outside the wlesh assembly in cardiff bay from feb 2004. If it is more than 12 months since you became first aware of the problem, please give the reason why you have not complained to the Ombudsman before now: I have complained to the Ombudsman before and they have seen fit to ignore any of the issues that I have had to raise. Do you have any documents to support your complaint? Please tick appropriate box below: I ticked yes and then typed in my blog address http://bbccrazydave.blogspot.com/ and checked the box to confirm the details of the complaint. I trust his will do Claire until your online system works with a comfirmation page. Well can anybody tell me what this form says that my emails havent, that my notice of blogs havent I wonder, and as for the Rhodri Morgan bit I may just have well said Rodney Bernman the Chairman of Cardiff County Council or Gordon Brown or one of my local councillors who do jack on my behalf, so the Equality Human Rights Commission have washed their hands of me, the Law Society did it oh so long ago as well, Judge Hickingbottom is still no doubt getting a nice earner out of his role as the DLA Commissioner chief and the Vulnerable who he is supposed to protect just keep on getting screwed. I wonder if I ought to make a complaint to the MET where I have failed with South Wales Police cos the IPCC don't give a damn. Do I have to post the internal complaints email never responded to by them to prove that. 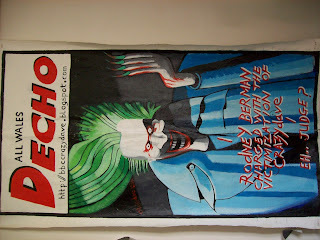 Hopefully my paintings will upload to this blog, and how many times will I have to put up with hearing Gordon Brown proclaim 'we will not walk by on the other side' at PMQ's Social Justice appears to work only one way, in the Elites favour, not the vulnerable we are just cash cows to those mothers. If you don't complain nothing changes. Thats a laugh when your names Crazydave.